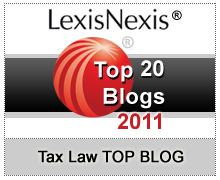 Brager Tax Law Group appreciates all the votes that came in for our Tax Problem Attorney Blog and is proud to announce that Tax Problem Attorney Blog has been named one of the top 20 Tax Law Blogs by LexisNexis. The voting isn’t over, though. Brager Tax Law Group is asking for your vote once again in the selection of the Top Tax Law Blog of the year. You will need to be registered in order to vote. If you haven’t previously registered, follow this link to create a new registration or use your sign in credentials from your favorite social media site. Registration is free and does not result in sales contacts.